Despite this list being about the best CrossFit gloves, I’ll preface this by saying that I normally don’t wear gloves or grips for CrossFit. To me, there’s just something about the direct contact of your skin with the bar. I’ve tried almost everything on the market, and even some gels or pastes to apply to my hands, but there was always something off about these remedies. That said, I still do try out a variety of grips and gloves, mainly for pull ups, especially when a workout calls for a high volume of them. My hands don’t seem to tear when it comes to any barbell movements (thankfully). 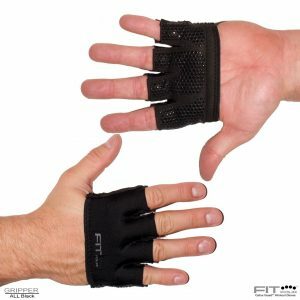 While this post is about the 7 best CrossFit gloves or grips, I can’t specifically say which one is best, as everyone tears in different ways – in the palm, just above the palm, on their fingers, etc. Also, some people, like myself, only use grips or gloves for certain WODs or movements. I’ll give you the pros and cons of each of the following products and for what types of movements, WODs, or tears they’d be ideal for. 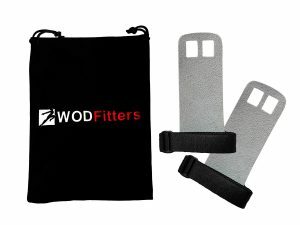 The WODFitters are as basic as you can get when it comes to CrossFit grips. You can get these in any brand and they’d basically be the same. Back when grips first came out for highly functional athletes, these were the only types available on the market. 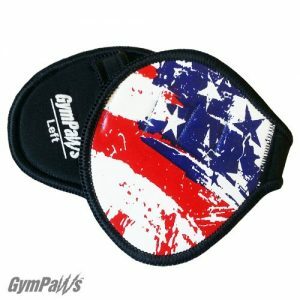 These hand grips are perfect for high volume pull ups and mainly for people who tear at the palms. For workouts that also mix in some barbell movements with the pull ups, the grips can be kept on or removed at the barbell portion of the WOD. If you tend to tear at your fingers just above your palm, then these grips won’t really do much for you. While these hand grips can be slipped off during part of a WOD without pullups, it can take time to remove and put on again. Another thing is the plastic clip that helps you adjust the strap around your wrist can get bothersome for some people during pull ups. It might even slightly hurt, depending upon the angle of the straps on your wrists. And if you need wrist support for barbell lifts in the safe workout, this doesn’t come with that feature. Using a separate set of wrist wraps in addition to these grips just won’t work. You won’t have a good time. The WODies 2 in 1 gives you a great a combination of the traditional gymnastics grip like the WODFitters along with the support of wrist wraps. This was an idea I thought of a while back, and of course, you can find these all over the market now. The wrist support is a big deal if you need to do overhead barbell movements in the same WOD as your pullups. This is the type of grip you can wear for an entire workout. The wrist wraps stay in place with velcro, so they’re easy to remove and put on again. 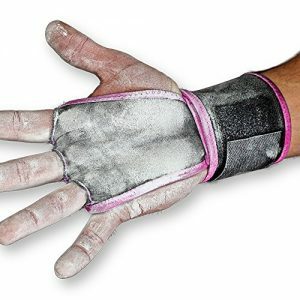 Compared to the WODFitters, the gymnastic grip is wider and protects more of your palm, accommodating for this with 3 holes in the grip for your fingers, instead of 2. On top of that, these grips protect the very top of your palm, just before where you fingers are. Traditional grips don’t protect this. And who doesn’t love a wider variety of colors to match your workout outfit? Might feel a bit bulky for some. And the wrist support may not be necessary for every workout where the grips are needed. They’re about double the price of traditional grips. Then again, you basically get 2 accessories in one. The Emerge pullup grips are essentially a more robust version of the WODies 2 in 1. These have stronger grip and still provide the wrist support you need. They can be worn for an entire workout, and even people who don’t CrossFit can benefit from these grips. If you tear just above the palm and right where your fingers start on your hand, these are the grips to get. You get the effectiveness of the WODies 2 in 1 for cheaper. Like with any grips or gloves, the Emerge grips can feel bulky to some. For the fashion conscious, these only come in black or pink. There are no other options. Okay, when I first saw The Gym Paws grips, I laughed. I’m not gonna lie. They looked like something I would use to hold a hot plate or bowl coming from the microwave. However, with over 1000 reviews on Amazon, a lot of people are raving about this. The Gym Paws are lightweight and are not bulky compared to those wrist wrap/grip combinations. They tend to last longer due to leather material. They’re much easier to put on and remove compared to traditional grips, so you can simply take these off when the pullup portion of your WOD is over and put them back on again with ease. These protect a good portion of your palm and also help prevent tears at the top of your palm and at the lower portion of your fingers. The Gym Paws come in a wide variety of colors and designs on Amazon. And to top things off, these are some of the best CrossFit gloves you can get for the same price as the traditional WODFitters. The simple mit design isn’t for everyone. The Gripper is a close contender to the Gym Paws. 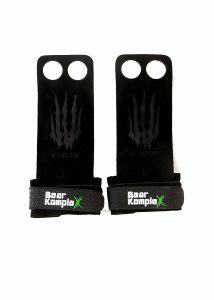 They’re also of the minimalist type of grips, yet unlike the Gym Paws, which are almost like pads on your hands, the design of the Gripper is more like a glove stripped of the lower palm area and the tops of the fingers. Easy to remove during a workout thanks to the minimalist design. Do an excellent job of protecting the upper palm and lower portion of your fingers. Come at a solid, affordable price similar to the WODFitters and Gym Paws. They don’t really protect the lower palm area that well. To some, they might feel weird to use for movements aside from pull ups. These might not be that ideal for barbell movements. It all depends on the athlete’s preferences. The look and styling isn’t for everyone. No, we’re not talking about the movement. We’re talking about the Bear Complex grips. The Bear Complex grips are very similar to the traditional WODFitters, yet with some improvements. Simple CrossFit grips that remove the irritation of the plastic clip on the wrists. Comes in the traditional 2 hole version and also the 3 hole version to account for a wider surface area of protection on your palms. Provides some wrist support for lifts. The wrist support is not as strong as the wrist wraps from the WODFitters or Emerge grips. 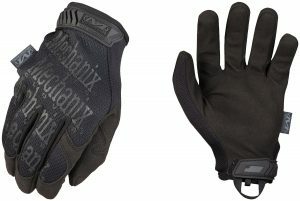 Yes, these Mechanix gloves might seem a bit off the wall for a list of the best CrossFit gloves. I mean, they are actual gloves yet used by mechanics and other workers who extensively use their hands. Back when Reebok first released their workout gloves (overpriced and easy to break), I was looking for an alternative to a full glove that actually was affordable. Very inexpensive. While these may not be as sturdy as a lot of the grips mentioned above, you can easily replace a pair without breaking the bank. They protect your whole hand. Can easily be used for both pullups and barbell movements. There’s no need to remove the gloves when you switch movements. Wearing a full glove is bothersome and can get in the way of a WOD. While these gloves protect your full hand, they don’t provide the best grip out there. However, for gloves that weren’t made specifically for CrossFit, they’re not too bad. The Mechanix gloves wear down quicker than grips made just for CrossFit. It can look pretty ridiculous wearing mechanic gloves during a workout. I’ve tried pretty much everything. For years, I’ve been sick of tearing my hands at the worst times, so I’ve always wanted to find a solution. For the most part, I don’t use any grips unless I tear really bad. I’ve been using more of almost a false grip with the bar for my pull ups. As a result, I’ve been tearing less just above my palm. If I do tear, the next day, I just tape my hand up. However, there are times when I really need something with more grip than the tape, so that’s where something like the the WODFitters or Gym Paws come into play. In the end, it all comes down to what works for you. Yes, I hate to say that, and it sounds cliche, but everyone tears differently and everyone has their own preferences when it comes to grips and for what types of workouts to use them. Fortunately a lot of these grips are rather inexpensive. My 2 cents is to go through what I wrote above and make a decision on a pair of grips that would suit your situation. If it doesn’t work, then try another. This trial and error can seem annoying and costly. However, I think of it like this. Tearing is one of the biggest issues with CrossFitters. 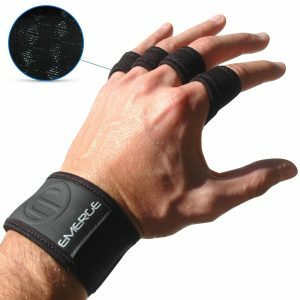 Whether you’re a competitive athlete or just an everyday WOD warrior like myself, then finding the solution for your hands that can reduce your tears (you can’t prevent them completely) can be worth all that trial and error.